BACKTOFRANKBLACK.COM: FREE BacktoFrankBlack: Millennium Group Sessions #2: Legion now available! FREE BacktoFrankBlack: Millennium Group Sessions #2: Legion now available! 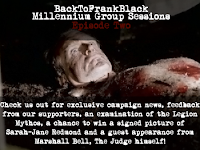 3 Responses to "FREE BacktoFrankBlack: Millennium Group Sessions #2: Legion now available!" Just finished listening to the 2nd podcast, great stuff. I wanted to mention I was at the same convention Jim was in Manchester that Lance attended. I was the one who asked about future Millennium and remember being so excited after Lance implied he would appear in the X Files sequel. A great interview with Marshall Bell and a fantastic overview of the Legion arc through the 1st season. I agree totally with Jim's analysis of Legion's manifestations in The Judge, Lucy, Pepper etc. Would like to add that the impression I always had from Chris Carter's interviews, was that there was a deliberate ambiguity through the first season about evil, about nature versus nurture, whether evil is internal or external. Atkins line from Gehenna sums it up perfectly: "I've seen the face of evil, Frank. I've looked into its eyes, seen it staring back at me. The face has always been a man's face, a human face. I've always believed that evil is born in a cold heart and a weak mind." I felt Legion was attracted to those cold hearts and weak minds, to people capable of unbelievable cruelty like Fabricant. It's clear that Lucy became involved with Fabricant merely to get closer to Frank to tempt him to the otherside, as Pepper later tried to. Legion's interest in Frank always seemed to me to be very much the abyss looking back at you, and it's eventual personal cost to those willing to gaze too long into it. For future shows I hope you continue this quality, but also broaden your features to cover fan efforts like the virtual seasons. Keep up the great work gents, after all, this is who we are. Thank you so much for taking the time to share your thoughts on the podcast, we really do appreciate it and we have received a number of congratulatory messages via email, Myspace, Twitter and so on which are alos very welcome. I believe the guys have touched upon the virtual seasons in the first podcast, albeit a passing reference, and I have certainly discussed with our friends from the Millennium Apocalypse team regarding the possibility of an appearance, I will certainly approach Dan Owen about such a thing as well. Having the listeners suggest content is exactly what we hope will happen and we encourage anyone reading this to do the same. Thanks Baz. Some wonderful commentary and I've had to have a think about what you said. I think I might hold on to the next podcast - we might get time to just chat about such perspectives as you've offered!